Whenever you connect your camera to your Mac, you get an annoying message from the app if you want to copy the photos. This task can be automated, thereby save time and reduce the chances of duplicating photos. Ingestamatic is a Mac app, which automates the critical, but repetitive, tasks of copying images from a card or camera to your Mac. Unlike the Finder or Image Capture, Ingestamatic does the job safely and productively, with lots of added functionality. Rename Files: Rename with a date, your initials, the camera model, the image type, and more. Build up your own file name with nearly 100 macros referencing EXIF and other data. Translate serial numbers, model names, and more to labels with lookup macros. Place images into folders: Create folder names using the same flexibility and macros available for file names. Easily assign images to folders based on date, file type, camera, shoot name, and more. Geotag: Assign coordinates (latitude, longitude, altitude) to images from a GPS track log, even if your camera doesn’t have a GPS capability. Preview both tracks and geotagged images on a map. Correct for time zone and camera-clock error. Does both manual (choose location on map) and automatic (interpolate location from track) geotagging. 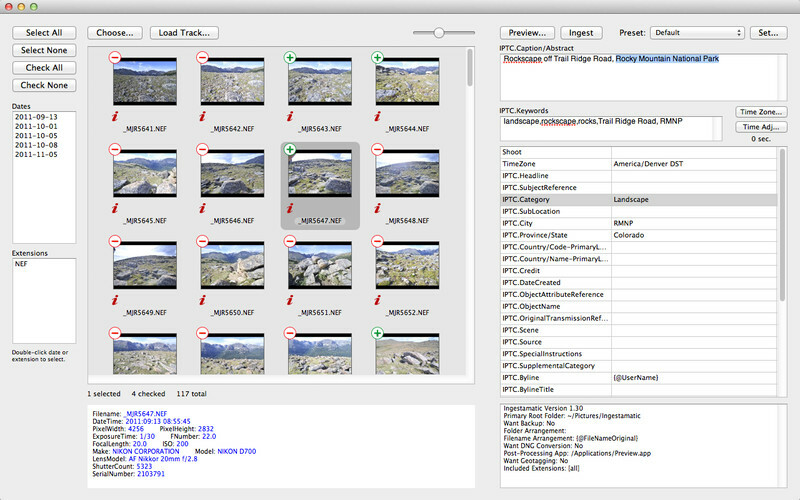 Add Metadaya: All important IPTC fields are supported. Assign metadata to individual images, groups of images, or the whole ingestion. Use macros in metadata fields. Preview metadata before finalizing the ingestion. Save settings with presets: Presets you define make it easy to reuse settings. Choose the preset appropriate for each shoot or group of images. Presets can be restricted to file types, so it’s easy to have, for example, one for videos and one for stills. Choose images and view previews: View images window-sized to decide what you want to ingest before using up disk space with images you later want to delete. Easily include images to be ingested, and skip images you don’t want. Convert to Adobe DNG: Automatically run Adobe’s DNG Converter during ingestion to convert to DNG and bind metadata into the file. Backup: Create a backup during ingestion to safely store images on an external disk drive. Ensures that you have a backup while the images are still on the card or camera. Ingestamatic’s flexibility for renaming, arranging into folders, and composing metadata is extraordinary. You’ll find that you can easily set it up to do things exactly the way you want. Fortunately, Ingestamatic is ready-to-go when you first install it–you don’t even have to open the settings panel until you’re ready. Ingestamatic is available in Apple iTunes App Store.